Precision made, hardened steel bits give you the right selection for repairing guns, cameras, computers, watches, and many other small items. 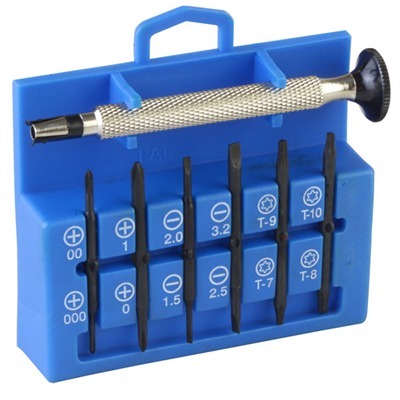 Kit features six double-ended, quick change bits to fit most small screws found in the shop or home. Bits snap into large, deep knurled, swivel top handle that provides easy one-hand use. Gives finger-tip control with tiny, easy-to-lose screws. Handle and bits are packed in a convenient plastic storage holder marked with the size of each bit. SPECS: Four Phillips (000, 00, 0, 1) bits. Four slotted (1.5, 2.0, 2.5 and 3.2mm) bits. Four TORX (T-7, T-8, T-9 and T-10) bits.